There are numerous times when being able to pour yourself cup after cup of coffee is so much easier than having to brew each one individually. And what about when you have visitors and want to pour each of them a cup of coffee? This is where a coffee percolator is so helpful as you can make several cups in one go, and then pour at your convenience. Choosing a percolator can be tricky due to various types, sizes, capacities, and prices to consider. Fear not, as our coffee percolator reviews will explain all. How do I use a coffee percolator? What is a percolator coffee maker? This stainless steel coffee percolator provides an elegant and durable solution for making coffee for either yourself or your guests. It is simple to use, easy to clean, pours perfectly and for such a quality product, is priced very reasonably. This classically styled coffee percolator makes the job of brewing fresh coffee almost as big a pleasure as drinking it. It's made of durable stainless steel so you can be sure it will last a very long time. It can make between 2 and 12 cups of coffee at a rate of roughly one per minute. Once the coffee has brewed, an indicator light lets you know it is time to pour. This percolator keeps your coffee hot from the first cup you pour until the last one and it does this automatically so you do not have to keep checking it. The inner parts, such as the percolator tube and the filter basket, are also made of stainless steel which makes them durable and keeps them corrosion free. The percolator is electrically powered, with a removable cord, so that it can be neatly stored away. With the cord removed, cleaning the percolator is a simple matter of rinsing it in warm, soapy water. You can give the filter basket and spout a more thorough scrub, using a pipe cleaner or soft brush. It looks great, it's simple to use, easy to maintain, and it can make you a wonderfully fresh pot of coffee, so it is little wonder that the Presto Coffee maker, is our best buy coffee percolator. It’s easy to pour spout, and traditional design allows you to get the best coffee at any given time. 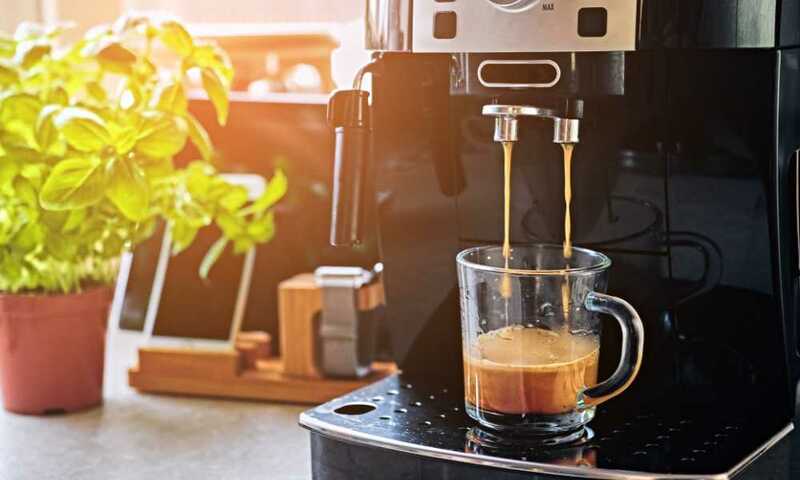 Additional reasons to make you love this coffee maker include the signal light that lets you know when your coffee is ready to serve and stainless steel perk tube and filter basket. 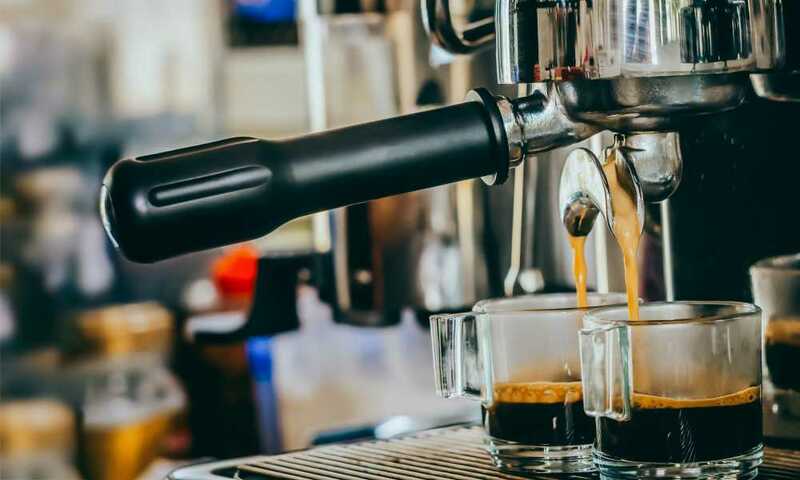 The Presto Coffee Maker is of stainless steel which means if you brew a pot of your favorite caffeine drink, you'll need to wait until it cools for you to make another cup. However, remember this coffee maker ensures you get hot and great tasting coffee, which means you, may be prepared to wait. If you want a simple stovetop percolator which allows you to simply brew and then pour, then this Medelco Glass Stovetop Percolator, should fit the bill. It can be used on either gas or electric stoves and is super easy to use. The Medelco 8 Cup Glass Stovetop Percolator has that classic glass coffee pot appearance that many coffee lovers will instantly recognize. Its round base is made is made from top-quality Schott Duran borosilicate glass which is specifically designed to withstand high temperatures. 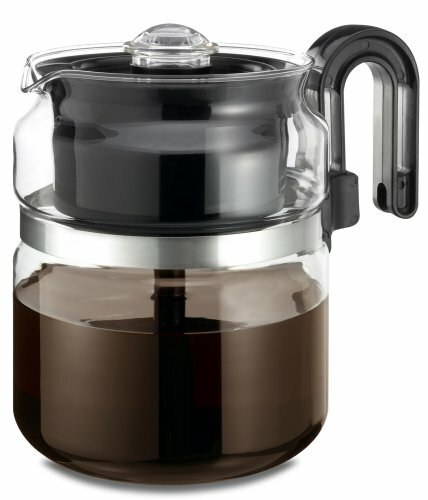 Schott Duran is one of the world's most respected manufacturers of glass and ceramic products, so you can be sure the glass used for this percolator is of the highest standard. The handle is shaped perfectly for holding the percolator comfortably and the material it is made from is designed to absorb any heat, therefore eliminating any danger of your hand getting burned. 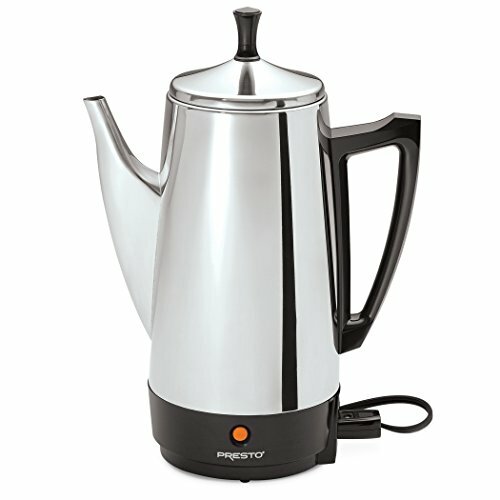 The percolator is suitable for use on either a gas stovetop or an electric one. A metal heat diffusing trivet is supplied with the percolator which must be used if it is sitting on an electric stove. The percolator has a capacity of up to 8 cups of coffee, and when pouring you won’t make a mess thanks to the drip-free spout. When the percolator is empty and needs to be washed it can be placed in the dishwasher with your other dishes. It is also stain resistant so it should stay looking good for many years of use. There is no mistaking the quality of the glass used for this percolator given that it is glass manufactured by Schoot Duran. Add to this the fact that it also brews a great cup of coffee, then this wins our award as the best glass coffee percolator. Another reason to make you consider buying this percolator is its heat tolerant handle which is meant for use on all types of cooking surfaces. By choosing to purchase this percolator, what you'll get is an affordable brewing option that will ensure you brew your coffee anytime you want. The filters on the Medelco Percolator are a bit small to fit, which is one issue the manufacture should look at. Another downside is that the center post is quite large, which makes the filters difficult to fit. We're not sure if us describing a coffee percolator as looking 'tough' makes it seem any more desirable, but there is no denying that this looks like a sturdy and durable product. This is why it is perfect for use outdoors such as when you are camping or even having a barbecue in your garden. We mentioned about this coffee percolator looking tough and when you see its shape and size you'll understand why. Unlike some of the more elegant, tall and thin percolators, one practical advantage of this is that it is less likely to be knocked over. 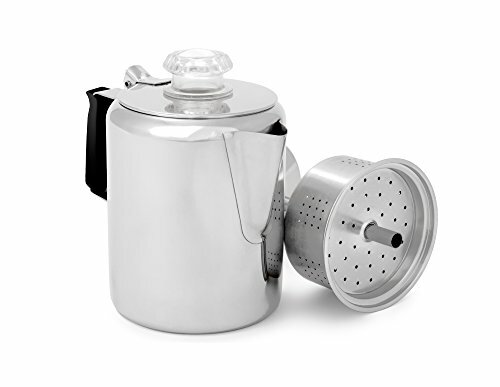 The robustness of this percolator is further enhanced by the fact that is made from high-grade stainless steel which will resist rusting and corrosion, not to mention any bumps it might receive when being used. The handle is made from silicone which will resist any heat transfer, thus keeping your hands safe. Although you can heat the coffee in this percolator on your domestic stovetop, it is also perfectly suited for use when camping or other outdoor activities. Simply place it on your camping stove or a fire grate and it will brew up some delicious coffee every bit as tasteful as it would in your kitchen. The lid is hinged for easy access to the filter basket, and on top of it there is a clear, see-through handle which allows you to monitor how your coffee is brewing. The percolator has a capacity of 12 cups, so there is plenty for everyone, and when it needs to be washed, it can either be washed with soapy water or placed in the dishwasher. This is one of the most durable coffee percolators we have come across and perfect for outdoor use. Therefore, it is our #1 choice for the best camping coffee percolator. Perfect size for someone who is traveling, regular camping and is easy to deliver seems it is not bulky. Easy to clean and is also safe when dishwashing. It is luxurious depending on its quality. Percolates well and also works over minimum flame and coals. Can also work on Trangia alcohol stove. The lid cannot be opened or removed while heating and it also doesn't use electricity. Some parts are easily breakable and it is quite fragile, so be careful it doesn't get knocked or dropped. 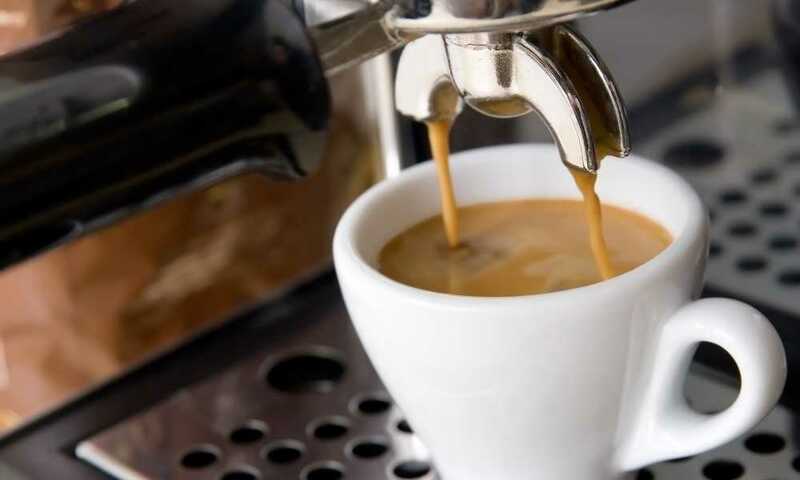 Many coffee drinkers prefer what is often referred to as a 'shot' of coffee which often means they like an espresso. 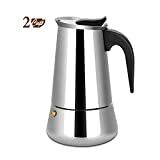 If this is you, then this simple but very attractive espresso coffee percolator is one you want to take note of as it not only makes great espresso, it has an amazingly low price. 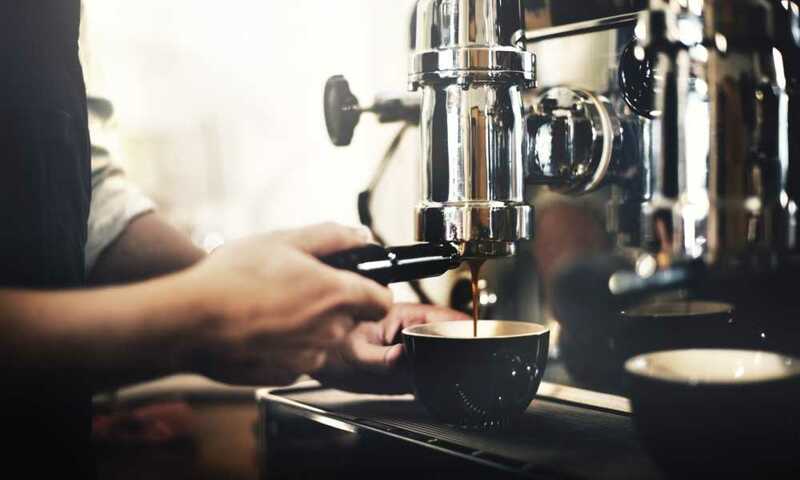 Lovers of espresso will know that a good espresso should have a bold taste without being bitter, and for that to happen a lot of the onus is on the coffee beans used. However, even having the best coffee beans won't help if the espresso maker or percolator can't brew them the right way. This is where the Amfocus Stovetop Espresso Coffee Percolator can help with its easy 3-step espresso making system. You simply pour in water, add the coffee to the funnel, and then place it on your stovetop and allow the coffee to percolate. Once ready, you can pour yourself a delicious cup of espresso. As the percolator has the capacity for two cups, you can either spoil yourself with a second cup or invite a friend to join you. For those who also like lattes or cappuccinos, you will be delighted to learn that this coffee maker can accommodate those too. All you need to do is add hot, steamed milk and enjoy. 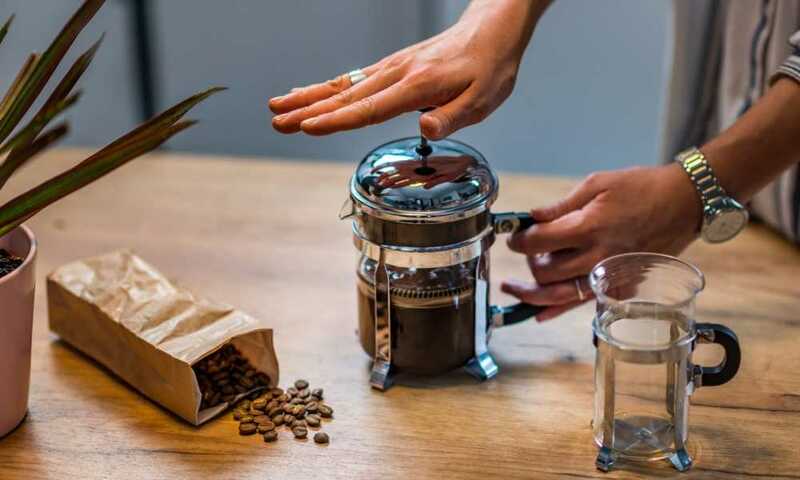 The Amifocus percolator is made from stainless steel so it will remain rust free, and to keep it maintained all you need do when you’re finished using it, is wash with soapy water and dry thoroughly. This coffee percolator not only makes great coffee, it looks very stylish too. It has everything you need to make great espresso, and its low price is amazing. That put it in the top spot for our best budget coffee percolator. 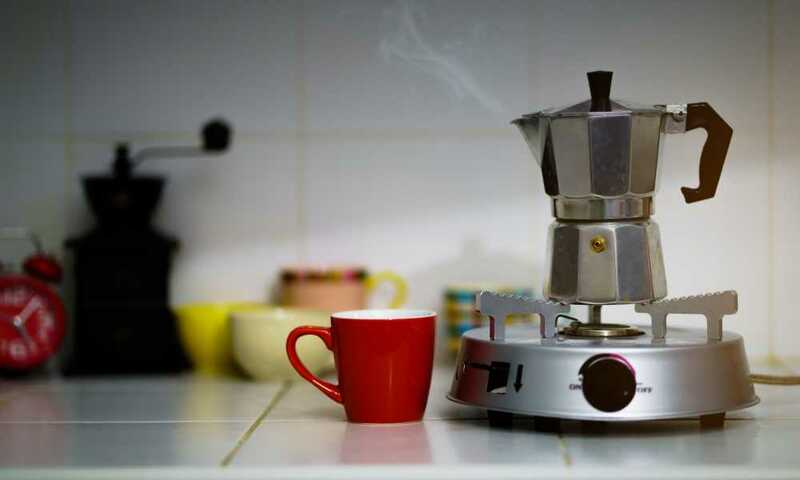 Stovetop Espresso Maker - makes 2 demitasse(1.5 ounce) cup of coffee in just minutes. Sanitary Stainless Steel, no aluminum, savor the original taste of coffee. Capacity: 3.4 fl. oz. Size: 3" x 6"(D*H). Fit for stovetop, induction or other cooktops, make sure to check it can sit on your cooktop before purchase. Easy to disassemble and clean, time saving and hassle free. Read the user guide before use. Idea to serve at home, office or as a travel coffee maker. 24h e-mail support with full care of your satisfaction. 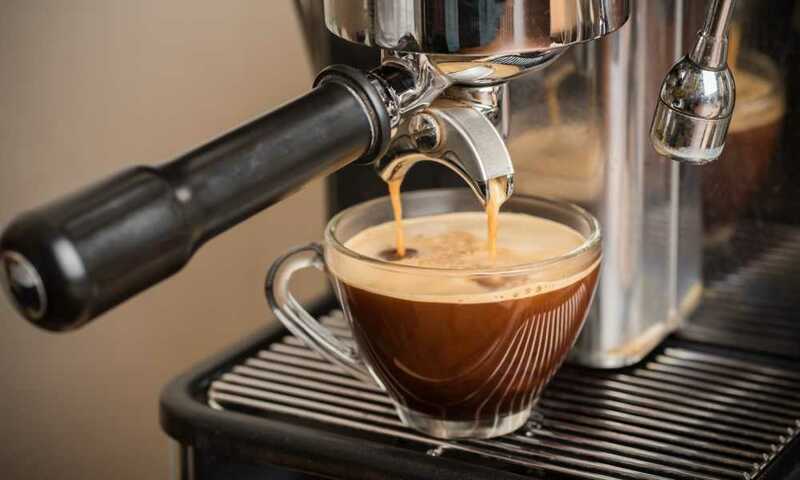 The Stovetop Espresso Maker heats up fast since its made of stainless steel (food grade) in both its outside and inside, which means you’ll enjoy having freshly made coffee anytime you want. This device provides you with a simple 3 step operation, ensuring you enjoy an instant cup of coffee. The Stovetop Espresso Maker doesn’t come with instructions. However, it comes with a video which may be useful to you. Its handle tends to get hot, which is something you should watch out for or use a smaller burner. This another coffee percolator which has a classic look to it, with a large looping handle and a stainless steel finish. With a 12-cup capacity, it is ideal for topping your own coffee cup or for serving guests whenever you have company. We mentioned the look of this coffee percolator in the intro, and we are going to again, given that this is one of the most stylish coffee percolators we have seen. It has a height of over 12 inches so it is taller than many others which makes it stand out. Add to that the contrast between the stainless steel body, and the black handle, lid holder, and base, this will look great in any home. It is an electric percolator and works at a brewing speed of around one cup per minute, up to a maximum capacity of 12 cups. All the interior parts you need for the coffee to brew such as the coffee basket, pump tube and spreader are included. Once your coffee is ready, you can pour from the non-drip spout which means no spills or mess. While you are enjoying your cup of coffee the percolator will keep what remains in the pot at the perfect temperature automatically. When you are ready for next cup it will taste as fresh and warm as the first one. The handle is extra-large so even the biggest hand will have no problems getting a grip on it. With your safety in mind, both the pot handle and the lid handle are made from a heat-resistant material so there is no danger of you receiving a burn. The percolator can be cleaned using a little soapy water. 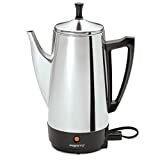 A very impressive percolator not least because of its durable stainless steel design, and with the ability to make 12-cups of excellent tasting coffee this becomes our best stainless steel coffee percolator. Maintains consistent brew speed: 1-cup p/min. 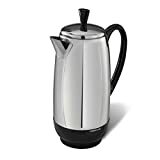 The Farberware Percolator offers you a 12 coffee cup capacity and is of stainless steel construction, which means it will serve you for longer. Another reason to buy this product is it gives you consistent brew speeds of 1 cup per minute. The result is you will enjoy your cup of coffee fast. One downside of the Farberware Percolator is that it doesn’t have a lamp indicator to show that’s it on or off, meaning you may forget and leave without switching it off. Being able to pour yourself several cups of warm coffee, or serving coffee to as many as 12 guests after their meal, is made infinitely easier if you have a coffee percolator. Now instead of having to brew several individual cups of coffee, you can make it in one go, and pour as and when required. Coffee percolators come in many types, and sizes and each have their own specific set of features. Here are some of the most important ones you will need to consider. The most common types of coffee percolators are those which have a handle on one side, and a pouring spout on the opposite side. Inside there is a filter basket where coffee grounds are placed. Then water is poured in and the coffee can brew. Once it is ready, the coffee can be poured as required. Apart from different sizes and shapes, including the type of spout, the main difference between these is how the coffee inside is kept warm. Some percolators are powered electrically with a small heating element inside them. These tend to have an automatic cut-off so that the heat doesn't get too high. Those that are not electric will be stovetop percolators that can be placed on electric or gas heating rings, although it must be noted that some can only be used on electric stovetops, so check this beforehand. Some percolators are more suited to camping and outdoor use, and these can be kept warm on camp stove or fire grates. 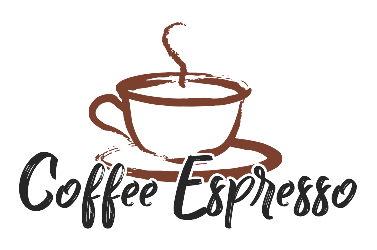 If you especially like espresso, then there are some available which are designed to make this type of coffee drink. The material from which percolators are made also differs. Many are made of rust-resistant, stainless steel, and the other main material used is toughened glass. Most percolators will have the capacity to make between 8 and 12 cups of coffee. This should be sufficient for most needs. Although their capacity may be the same, the size and shape of the percolator may differ. Some are tall and thin and have a classic look. Others tend to have a wider body but are not as tall. This particularly applies to glass percolators and those which are designed for outdoor use. Espresso percolators have a much smaller capacity and normally only make two 1.5-ounce cups at a time. Your choice of percolator may depend on whether you see your percolator as just functional or whether you also want it to look good too. There are many which fall into both categories. Glass and camping percolators tend to be basic round shapes, and just get on with the simple task of brewing your coffee. You will find others that are no less capable of making great coffee but which are more visually appealing. This will involve the use of long swan-neck spouts and curved handles. Other features to look for include keep-warm functions in electric percolators so that even when you pour your fifth or sixth cup, the coffee is still warm. Easy-to-clean filter baskets make maintaining your coffee percolator hassle free. Drip-free spouts prevent both your furniture and in some cases your guests from having to endure coffee stains and heat-resistant handles make sure your hands don’t get burnt. This is where you need to decide whether getting value for your money is more important to you than buying the percolator you want at any price. To be fair, even the highest priced percolators shouldn't break the bank, with the very top prices being over $100. However, the average is much lower than that, with some bargains priced at less than $20. The first thing is to make sure everything inside your percolators is clean, especially the filter basket and the stem. Pour the required amount of water you need into your percolator. Add approximately one tablespoon of coffee for every cup of coffee which you plan to make. Close the percolator lid, and then either switch it on if it is electric or place it on the appropriate stove top. Let it heat gently without boiling as this can negatively affect the flavor. Once the coffee starts to splutter, or 'perk' then it is ready. You can continue to let it perk for between 7 and 10 minutes depending on how strong you prefer your coffee. Coffee percolators were once one of the most popular ways to make coffee but their use had been in decline due to the rise of modern and instant coffee makers. Thankfully they are making a comeback and are still one of the best ways to make delicious coffee. They work on the basis that you pour in water, add your coffee grounds and then allow the coffee to 'perk' or bubble. Coffee percolators do not require paper filters so it makes them good for the environment. They are also more robust and longer lasting than many other types of coffee maker. What does a coffee percolator do? Apart from the obvious answer of 'make delicious coffee,' we shall answer by explaining how it makes delicious coffee. The word ‘percolate’ means a fluid passes or soaks through another substance and emerges with different qualities. In a coffee percolator, as the water heats towards boiling point, bubbles in the water rise through the stem, and the pressure created causes the water to rise upwards. At the top of the stem, the water disperses through the holes in the filter basket and thus soaks through the coffee which is inside, and back into the pot. The water continues to circulate in this way, which means each time it passes through the coffee it becomes stronger. When the water reaches boiling point, it will start to bubble or 'perk' which is the cue to take it off the heat, and that your coffee should be ready to drink. 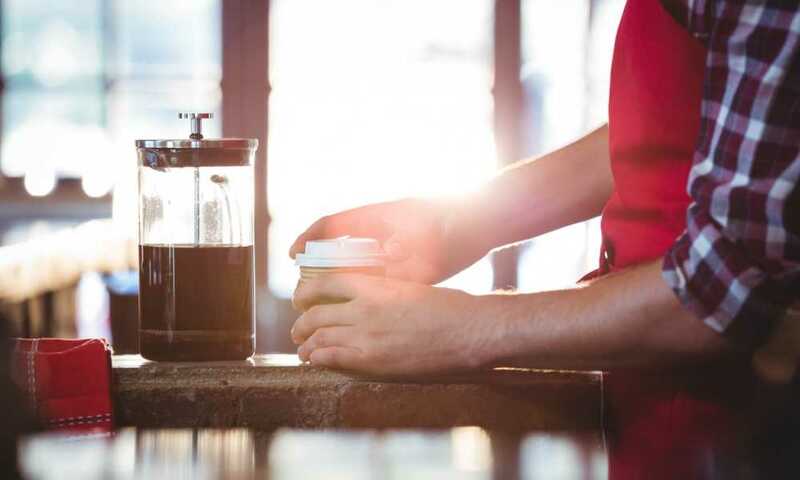 Percolated coffee will be different from that made in drip-type coffee makers but whether it is any better or worse will often depend on what the person drinking the coffee preferred. Percolated coffee will have fewer of the subtle flavors but on the other hand, it will have a richer, generally stronger taste. The large variety of coffee percolators meant when trying to choose the best ones, we felt like we were comparing apples and oranges, so it wasn't easy. Looking firstly at the types of materials used, we felt the best stainless steel coffee percolator was the Faberware 12-Cup Percolator, which is not only durable but also has a large capacity too. When it came to glass we chose the Medelco 8-Cup Glass Stovetop Percolator as our #1, in no small part due to the quality of the glass used. For those who love to go camping and want as many of the comforts of home (such as a great cup of coffee), we think the best camping coffee percolator is the very sturdy GSI Glacier Stainless Steel Coffee Percolator. 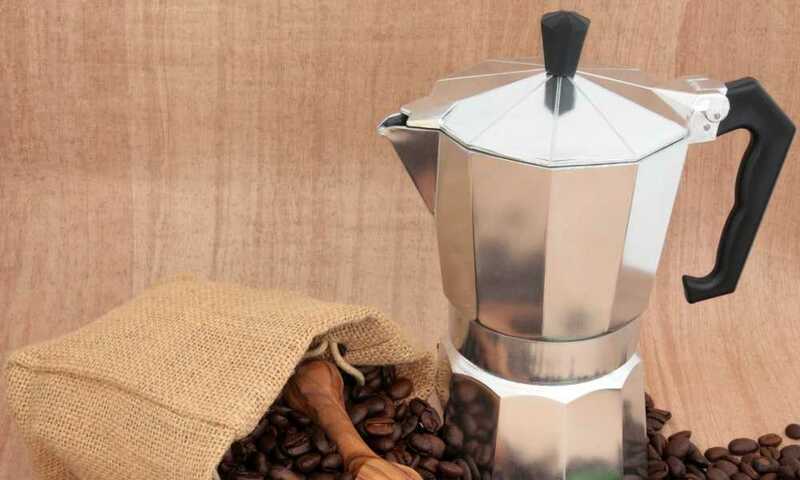 If espresso is your thing, then look no further than the Stovetop Espresso Maker Coffee Percolator, which wins our best espresso coffee percolator award. Finally, we come to our best buy coffee percolator, which we have given to the Presto 12-Cup Stainless Steel Coffee Maker. It looks very stylish, has a high capacity, and most importantly makes a great cup of coffee.